Drilling Hydraulics Solutions & Performance Software. One of the basic features of drilling fluid is to remove the drilled cuttings from beneath the bit. The fluid pumped through the bit nozzles exist at high velocity and impacts the whole bottom. After impact, a crossflow develops that forces cuttings away from hole bottom and up the annulus. Penetration rate and overall drilling cost depend greatly on the cleaning action of the drilling fluid. Bit hydraulic horsepower, impact force, and nozzle velocity are common criteria for optimizing jet-bit hydraulics. Sometimes Drilling engineers overlook this simple but important concept about hydraulic performance and optimization.We are not reinventing the wheel here, I’m just suggesting use your knowledge and apply it. The concept of drilling Hydraulic Optimization is based on the best condition to clean the well is when the force provided by the jets is the maximum. If you drill a shallow hole section, the maximum impact force is recommended. However, if you drill a deeper section, the maximum hydraulic horsepower is better than the maximum impact force. Maximum Hydraulic Horsepower will happen when the pressure drop across the bit is equal to 65% of total pressure loss; therefore, 35% of total pressure loss occurs through the drill stem. 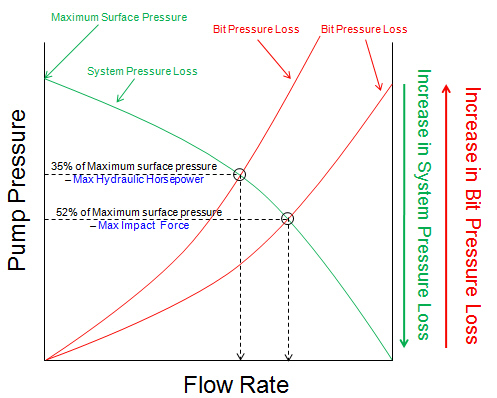 Maximum Impact Force, based on the mathematical solution, this condition occurs when bit nozzles and circulation rate are properly selected to create a pressure drop across the bit which is equal to 48% of total pump pressure. Many engineers just don’t have the right tools to do this and they have to use trial and error to get closer results, but when some element within BHA changes or the wells gets deeper they have to do it all over again. Drilling Hydraulics Optimization helps achieve results effortlessly with just a few clicks. The pressure drop through surface equipment is one of the components in drilling hydraulics that must be considered. When we talk about surface equipment, we usually refer to those following equipment as a standpipe, surface hoses, a swivel, a goose-neck, and a Kelly. Because of a number of several combinations of surface equipment, four popular combinations are selected and the surface equipment coefficients for calculating pressure loss are shown in the below table. Red: Pressure Drop across bit is < 35%. Require optimization. Yellow: Pressure Drop across bit is > 35% and =< 48%. Optimization could be improved. Green: Pressure Drop across bit is > 48%. Good Optimization. Many MPD engineers would say, “it’s now our call design or deal with hydraulic optimization”, I see the point; however a proactive engineer could offer a little advise to their clients on something that could improve drilling performance or perhaps just increase the ROP, with just a few clicks!. Select any flow rate between Max Force impact and Max Hydraulic Horsepower, depending on your goals. Drillsoft drilling hydraulics software makes it easy!